Ringtone Composer - Ringtone Converter allows you to make your own ringtones and add new ringtones to your mobile or cellular phone whatever the make or model. the software has been extensively developed from the early days and is now very much more with support for practically every mobile phone available today. It is designed to run on both the Microsoft Windows and Apple Mac OS-X platforms. Ringtone Composer - Ringtone Converter no longer relies on conversion alone as a source of ringtones, it now comes with over 100 tones for your phone and a fully featured ringtone composer ! Additional ringtones and ringtone 'packs' are also freely available from user sites, further expanding the availability of quality ringtones. A powerful Ringtone Composer and Ringtone Converter for you ! How to use ringtone composer & converter adding more ringtones? 1. RTTTL Ringtones Composer - RTTTL ringtones are a standard format for monophonic ringtones, Once you have an RTTTL ringtone, it will look something like this: "Baa Baa Black Sheep: d=4, o=5, b=125: c,c,g,g,8a,8b,8c6,8a,g,p,f,f,e,e,d,d,c", simply paste this into the large white box on the main screen, Then click the "Convert" button to get detailed instructions on how to add the ringtone to your phone. 2. Midi format Ringtones Composer - Midi files can be used to create both monophonic and polyphonic ringtones with the Coding Workshop Ringtone Converter . 3. Nokia Composer format Ringtones Composer - Nokia Composer format ringtones look very similar to RTTTL ringtones, Nokia Composer Ringtones do not have commas between the notes and do not have a header containing the tempo, or song name. You can convert a Nokia Composer ringtone to RTTTL format to work with your phone easily by using Coding Workshop Ringtone Converter . 4. Other formats ringtones composer - Various other formats can be converted with the Ringtone Composer and Converter such as Nokia key press or Motorola key press formats. 5. Adding more polyphonic ringtones - The Ringtone Composer and Converter can convert almost any midi file into a midi or smaf format your phone can accept. How to use Ringtone Composer ? Ringtone Composer supports most makes and models of phone including Audiovox, Alcatel, Ericsson, HTC, Inventec, Kyocera, Microsoft, Motorola, Nokia, NEC, OKWap, Panasonic, Philips, Sagem, Samsung, Sony, Sendo, Sharp and Siemens handsets, with more added every month. 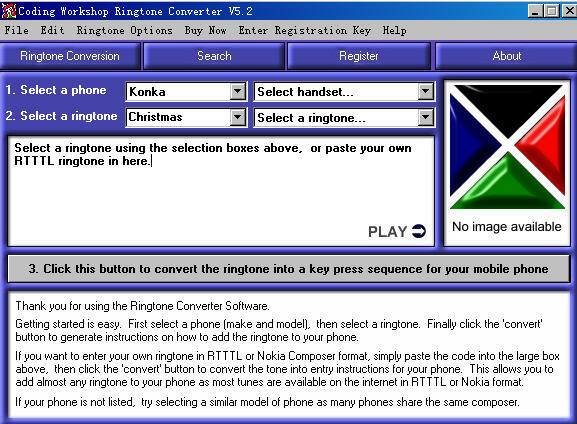 Ringtone Composer is designed to run on both the Microsoft Windows and Apple Mac OS-X platforms. Through the included ringtones, full rtttl support, the additional ringtone packs, and the ringtone composer functions, practically any tune you can think of is available for use on your mobile phone as a ringtone composer ! For the majority of handsets, the Ringtone Converter does not need any cables, infra red connections, sms or expensive 'premium rate' phone calls, all you need is the software and your phone! Whatever the capability of your phone, with the Coding Workshop Ringtone Converter you do not need to have any musical or technical knowledge, the software takes care of all the details for you.